What a veritable box of delights the bank holiday weekend has delivered to me. I’ve read about a man tormented by his friends abandonment of him; watched a play where the relatively only sane person gets shot and presumably dies; and watched grown men beat each other with their bras or whacking wooden willies. 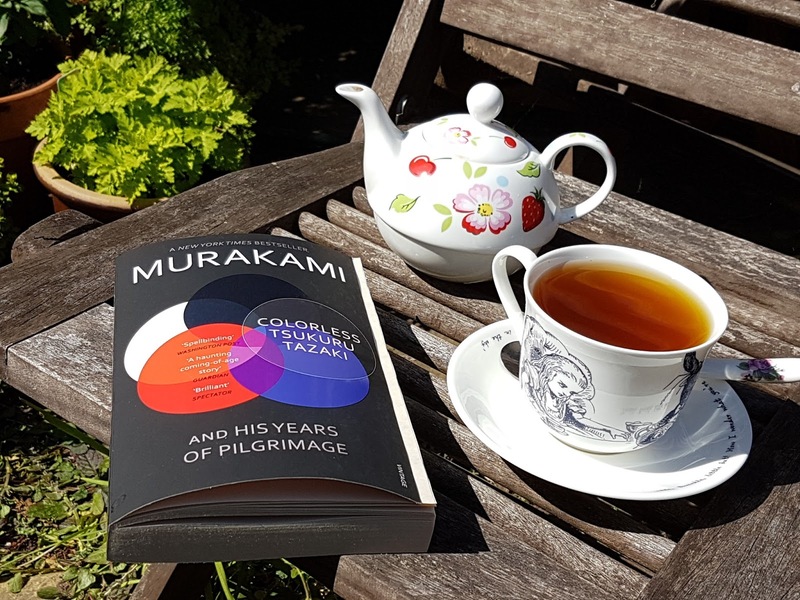 Colourless Tsukuru Tazaki and His Years Of Pilgrimage – by Haruki Murakami is possibly one of his more believable novels. Murakami writes about nightmarish situations which are relatable but usually too surreal to be taken seriously. In this novel though, whilst there is a small amount of the surreal, the power of dreams is considered by many to be our unconscious state talking to us, and so there is the element of suspended disbelief when reading the book. Tsukuri’s four best friends at school all have names which mean colours, red, blue, white and black. Tsukuru is the only one whose name is colourless and this upsets him, he thinks he is the boring one of the group, the outsider. The five friends promise to stay together forever, but an opportunity comes for Tsukuru to study away from home in Tokyo. He visits his friends frequently, as promised, but one day he returns and his friends no longer want to see him again. No explanation is given; apparently he should know the reason why he has been ostracised but he doesn’t. He returns dejected to Tokyo, stops eating and looks death in the face; his hurt unbeknown to his friends. He recovers physically, but mentality he faces abandonment issues which plague him for years, leading to an inability to form meaningful relationships. What is the point of giving yourself to someone, giving them your whole being, if one day they turn around and toss you away like a piece of rubbish? You assume you know someone…but you don’t…not really. Sixteen years later Tsukuru finally embarks on a journey to find out what happened. He confronts his friends, visiting each one without warning, piecing together a jigsaw about his past. It is a hauntingly beautiful tale which questions how people’s actions can affect someone so much. Tsukuru had low self-esteem and being abandoned by his friends made him feel worse. How strange to find out that his friends thought he was the strong one, the survivor, the one most equipped to deal with the real world. He thought he was plain, the colourless one whilst his friends thought him the best looking of the group, the achiever. It shows the differences with how we see ourselves, and how others see us. At times the novel is painful, you hurt when Tsukuru hurts, it is a novel where at times you see yourself, and at other times you see people you have known. It is a poignant tale which expands the mind, to make you think about how your words or actions might be misconstrued by people. If someone accuses you of something, can you really be sure that your friends know you well enough to stand up for you? Or will they fade into the background, vehemently agreeing with the perpetrator and leaving you out in the cold? Once again, Murakami weaves a his magic in an excellent book which is hard to put down. 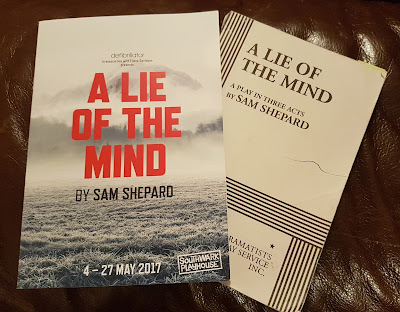 On Saturday I headed back down to London to watch A Lie of The Mind again. I had won a pair of tickets and as I don’t often win much I was claiming my prize! (This happened before I’d seen the play the first time, so I was praying it was going to be a good production!) I met my friend Janet and we headed to Waterloo and then had a pleasant stroll down the sunny Southbank towards The National Theatre for lunch. The usual entrance was closed off due to heightened security following the Manchester bombing, and the queue to get into the theatre was long and slow moving, so we continued down to The Globe and ate down there instead. After lunch we sauntered to the Southwark Playhouse where I tried to obtain my competition tickets. It took a while, despite me giving the theatre my name, they reserved my tickets in the name Laura Rogers – not Susan. (Laura Rogers, interestingly, is the name of both one of the actors in the play and my sister in law!) Anyway, we got to watch the play again, and second time was even better than the first. The actors seemed to have really relaxed into their roles and there were parts of the dialogue that I hadn’t picked up on my first visit which gave more insight into the various characters back stories. Understanding where these people came from and how they reacted to situations made the play flow through my head a lot better this time around. I found it interesting that the Murakami book I’d picked out of my bookcase had similarities to the play I was watching. The line which Beth (Ali Dowling) says still haunts me “This! This. This thought. You don't know this thought. How? How can you know this thought? In me." As in Murakami’s book, people are so quick to judge, so quick to say they know what someone thinks or feels? How? How can they know? All of us, actor or man on the street, can figuratively paint a picture of happiness or confidence or pleasure on their face, yet feel deflated or angry or upset on the inside. Both texts are a lesson in being a little less judgemental about people; although actions speak louder than words and saying is often easier than doing! Shall we have a cuppa before heading home? I decided to pop to the loo before heading off up and upon my return was surprised to see Ali had popped over to our table and was chatting with Janet. She was surprised to hear we’d come down to watch it twice, especially seeing as it was such a humid day. I told her I wasn’t intending on coming down to see the play, but after reading the script/book I had to. Beth’s character had grabbed me about page 5 and I had to see it. I said I had won the tickets to the second show and this gave me an excellent opportunity to look at the other characters in more detail. 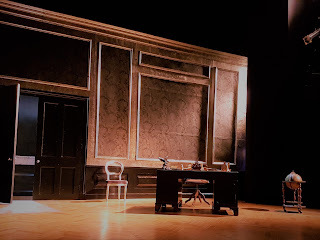 I mentioned that I had blogged about the play, and the more I wrote and thought about it, the more questions I had. It was like an onion, peeling through the various layers to see what was at the heart of the matter. 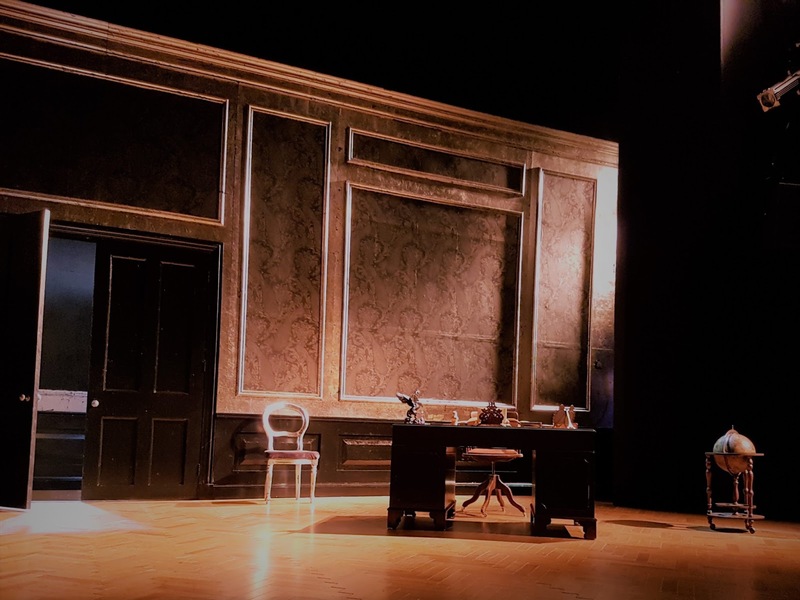 As we chatted it became clear that as the play had gone through its run, each of the actors had discovered more and more things about their characters, and I wondered if that was why this performance was even more nuanced than last weeks. It seemed a shame that just as they got to know their characters, the play had come to the end of its run! Speaking of endings, I hadn’t thought too deeply about the ending last week. I think I was too busy processing what I had just seen, rather than what happened after we’d said goodbye to the characters. There is no cut and dry answer. The script doesn’t tell you how each character moves on so I suppose it depends upon whether you like a happy ending or not! It was something that Ali and I picked up on as we’d both read the play…nothing is given away. 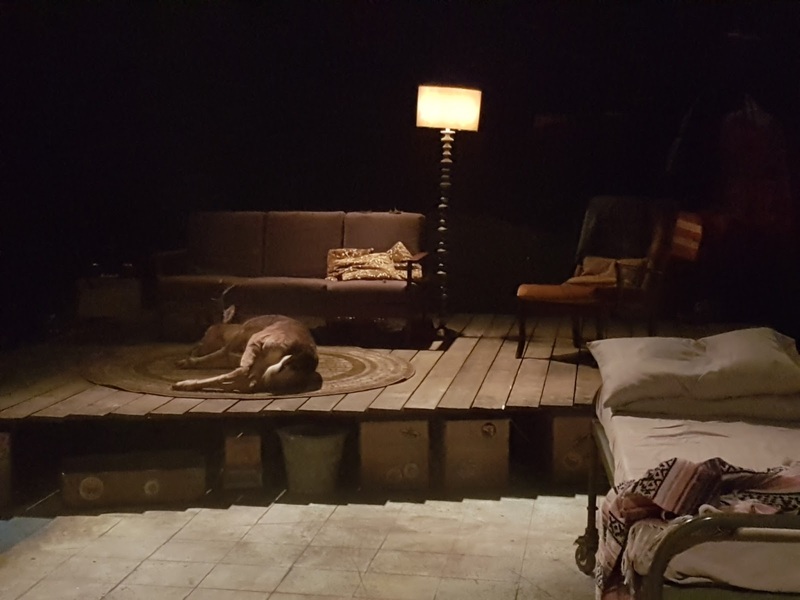 From watching the play, we said we assumed that Frankie died, as the play ends he is so static on the sofa it’s like he’s already a corpse. Ali said that was how Michael had chosen to play it, so Janet told Ali to tell him to give his fingers a wiggle on the last show…just to give the audience that little bit of hope! I guess that’s the good thing about some plays, they are so open to interpretation that there’s no right or wrong answer. It’s your gut reaction when you leave the theatre as to whether there is hope for those characters you have left behind on stage. Grab my stick and give it a whack! I have a friend who does Morris dancing; her husband sings in a folk band. I know very little about either pursuit, however, I’m an open minded person and am willing to find out about things, so when I heard that they would be at the Chester Folk Festival (in Kelsall not Chester as it happened) I said I would pop along for an hour or two on the Sunday to say hello. Now this isn’t the first time I’d been to the festival, I popped along last year, but ended up sitting in a field chatting with friends so I didn’t hear or see any of the shenanigans. Afterwards my friend and I wandered over to the beer tent, grabbed a pint and after having a catch up and putting the world to rights, we went to watch the Morris dancing. 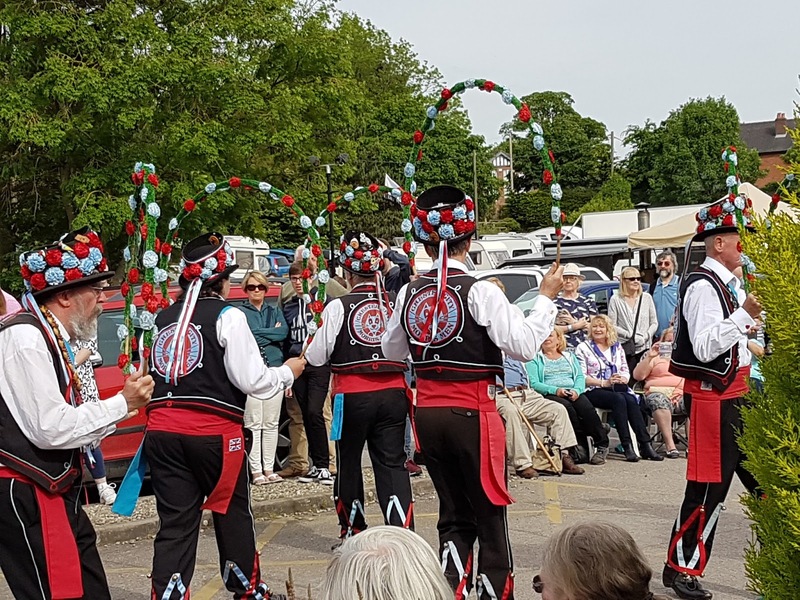 I thought Morris dancing was essentially clogs, bells and the waving of handkerchiefs, (apparently that’s the Cotswold dancing) however, Anne was on hand to give me a quick potted history of Morris dancing, and how it varies from region to region. I was too busy watching and listening to take many photographs until I remembered to do so at the end of the proceedings, but here are three of the different types of Morris dancing I photographed. border counties. The dancers have blackened faces which originally were used to confer anonymity on the person dancing. Morris dancers lay out a receptacle for people to put money in, so it was considered to be a form of begging which was illegal. Blackening the face with soot or coal dust was a bit like wearing a mask so people couldn’t be identified by the authorities. The dancers wear “rags” - old clothes covered with ribbons and hats adorned with pheasant feathers. 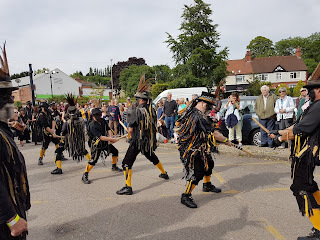 Many of the dances involve short sticks being hit against each other, and by the way these dances were being performed they were held in such a manner that it looked like willy whacking! Rapper Sword Dance – from the North East. The rapper is a two handled flexible sword. The dancers hold tightly to each end of the sword as they skip and weave amongst each other, the swords above their heads forming intricate patterns. The dancers also skip over the swords, and do backflips over them. At the end of the dance the swords have been weaved together to form a “star” which is held aloft. North West Morris - from Cheshire/Lancashire. Historically the dances often took place during Rose Queen carnivals. 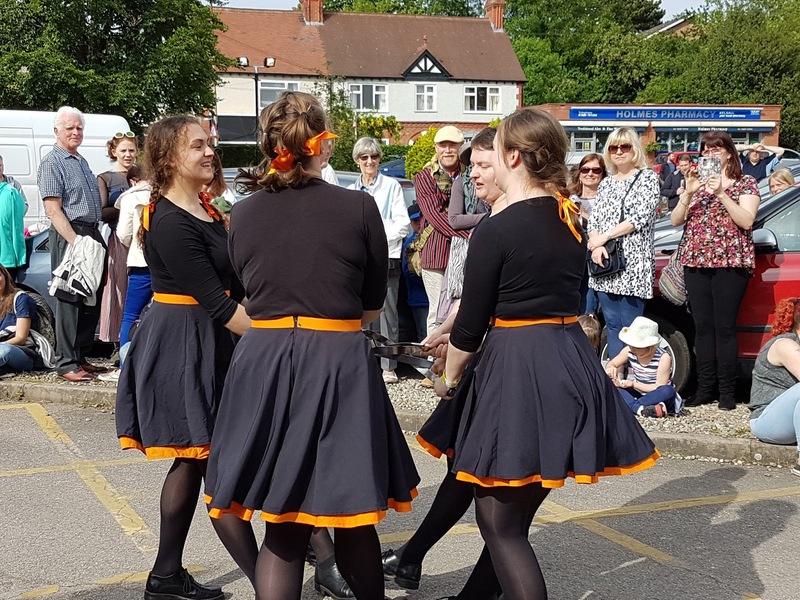 Dancers in two lines would dance in a procession, and these are the dancers I remember from Frodsham carnival when I was growing up! The costumes were usually white and the dancers wore clogs and flowery hats. As you can see from the photo the dancers were carrying hooped garlands of flowers. It was a wonderful insight into the world of folk festivals, and the thing that struck me the most was the camaraderie. So many people from all areas of the country seemed to know each other and more importantly were routing for each other. It was a great event to experience and one I will watch out for next year. 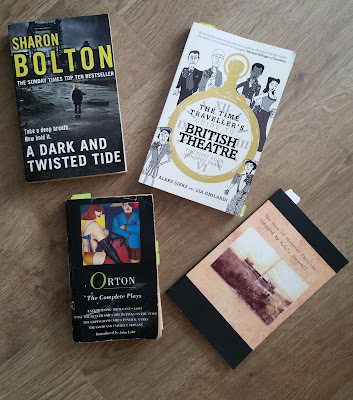 I don’t blog about all of the plays I see, all of the books I read or all of the activities I partake in; I write about the things which I have avidity for and which may be of interest to others. So when I start writing about a play within 24 hours of seeing it, you know it has left a mark on me. 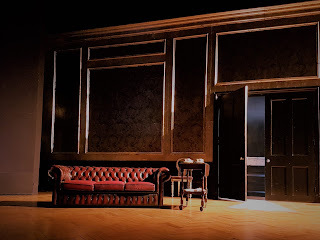 As soon as the play came to the Burketeers attention, a group booked to see it, but I foolishly said no, I didn’t see the appeal of travelling a long way to see a play about domestic abuse. If it hadn’t been for a marathon box set of Elementary I would have missed out on a gem of a play. How so you ask? Well the name Aidan Quinn kept popping up on Elementary and it was like an annoying blue bottle buzzing around. WHY DO I KNOW THAT NAME???? Best friend Google told me he was in Desperately Seeking Susan (I loved that film when it came out – I was 12, forgive me!) 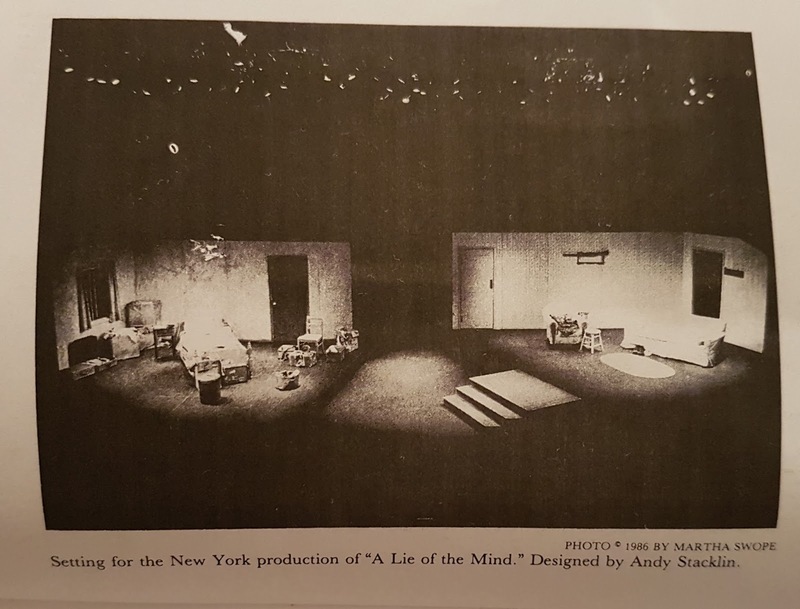 It turned out that he was also in the New York production of A Lie of the Mind in ‘85. I’m not sure if I believe in serendipity or not, it does seem to happen to me a lot, but I took it as a sign to read the play. 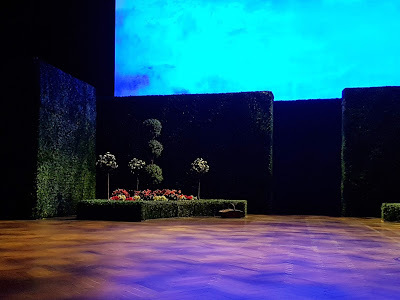 I bought a copy of the script and by page 5 I knew I would be buying a ticket and joining the other “Burketeers” for a highly intense and thought provoking theatre experience. A Lie of the Mind is about Beth, a woman who has been so severely beaten up by her jealous husband that she has been left brain damaged and living back home with her parents and brother. Her husband, convinced that he has killed her, confesses his sins to his brother and returns to his familiar home to be nursed by his mother. 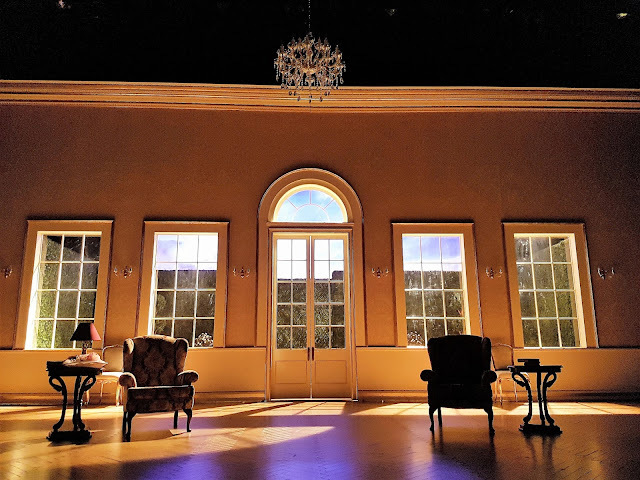 On the surface of the play it seems that Beth is the troubled one, she is the one with an injury to the brain, but go under the surface and every member of the two families have their own deep, dark issues to contend with. 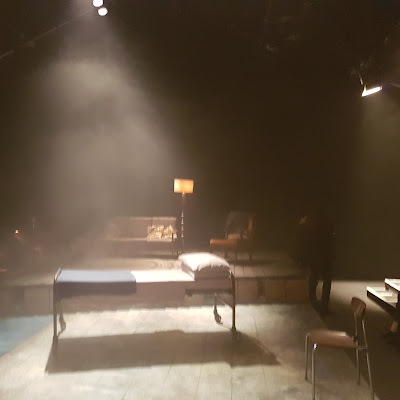 When I read the play, I couldn’t imagine how the large scale set of New York could be reduced to the small and intimate space of Southwark Playhouse, but clever staging and directing by James Hillier allayed all my fears. I loved the simplicity at the start of Act 1, whereby the cast simply turned a hospital bed around to switch back and forth from Beth’s story to that of her husband, Jake’s. This intimacy made each person’s story more powerful. The play centres around two families, both joined and torn apart by marriage. It sounds depressing, but in amongst the darkness, there is a light of hope and strength of human spirit that refuses to be diminished. We don’t meet Beth until after she wakes up in a hospital bed, bruised and bandaged. We only have her husband’s words echoing in our ears to know what she was like before. Was she really a slutty dresser? Did she purposefully try to incite jealousy and rage into her husband? Was she a woman who liked to play with fire? Was this just all in Jake’s head? We will never know the Beth of the past; we can only see the Beth of the present, the Beth who has a childlike innocence, played so evocatively by Ali Dowling. Beth inhabits a world of self-created delusion. Having suffered brain damage at the hands of her husband, she can no longer communicate as effectively as she once did. She shows the frustrations and inadequacies of human nature and learns to survive the only way she can, through her head, through the lies she tells herself. When I read the play I wondered what Beth would be like. If she was brain damaged, would she be able to remember any of her past, what life was like? Would she be angry and frustrated because she couldn’t do all the things she used to do? Would she be happy because she knew nothing else? She is a complex character and through the state of her mind she could travel in a number of directions. I loved Ali’s emotive take on her character and it answered many of my questions. At times she did show frustration, at others confusion, and throughout she showed the hope of one doing their best to survive the best way they can. But it is not only Beth that creates an alternative reality. You cannot access someone’s head, however hard you try; you can never know what someone is really thinking. You can never know what their take on reality is. Having been emerged into Beth’s family, you see that she is not the only damaged person, nor the only person to have suffered abuse. Meg, her mother is very meek and mild, but there is something about her demeanour that suggests this isn’t just because her husband is dominating and loud. She is fearful of conflict “Please don’t yell in the house. The walls can’t take it.”Nancy Crane trills, which seems an amusing thing to say and you chuckle when she says it, but then you reflect and think; how can a mother forget her own daughter’s wedding? Meg is a nostalgic character; she meditates on times gone past, such as Baylor fishing in the shirt that Beth has chosen to wear. But this is selective memory, she remembers the things she wants to remember, and blocks those she doesn’t want to recall. Why does she want to forget her daughter’s wedding? Baylor, the father, prefers to spend the icy days hiding in a hut trying to shoot deer. It is hunting season and that’s what you’re supposed to do. But why do it? Why subject yourself to the freezing cold when it turns out you hate venison? This is Baylor’s world, he needs an excuse to run away and hide from reality. When Baylor and Meg visit their daughter in hospital, Baylor appears more concerned about selling his mules than showing worry or concern for Beth. Beth’s brother Mike does show his sister compassion, he sits with her trying to encourage her recovery in hospital, but he is a man of limited patience and frustrated by everything around him, included Beth’s inability to communicate with him. He is an angry man whose anger is exacerbated by what he allows his mind to tell him. You would think that a man who beats up his wife so badly, to the extent that he believes he has killed her, would be the villain of the piece. Not so. At first you do hate Jake. There is no excuse for domestic violence, less so when he tries to avoid any responsibility for his actions, but as his story unravels, you realise how mentally unstable he his. Gethin Anthony gives such extraordinary life to this psychopath, a man who pretends to be insane, who psychologically unravels before our eyes as his unwitting mother tries to take care of him. The only person who can see through him is his sister, and that is only because she helped him to escape the blame for his father’s death by using the same tactics before. Lorraine, his mother, is blinkered; her son can do no wrong. He can’t have hurt Beth…and who is Beth anyway? It’s frightening how easily two mothers can allow themselves to forget their offspring’s wedding. But Lorraine needs to block out the pain of abandonment. Her marriage wasn’t a happy one, but that is a hard thing to admit to, so she feigns indifference. If you tell yourself you don’t care for long enough, you begin to believe yourself. So everything is fine. She is fine, her son is fine, her daughter is fine. But they are not fine. Lorraine, Jake and his sister Sally are all tainted by the events in their past, what they have witnessed, and how they have chosen to remember those events. Sally tries to run away from the past but knows she can’t, she knows she has to face reality, she knows she now has to make her mother see sense, to tell her the truth about Jake. She has tried to erase the memories of the Mexican drinking race that led to her father’s death just like Jake had, but she needs to leave the world of make-believe, she needs to come clean to her mother so they can start a new life together. She may be a minor character, but she is an important one and integral to the story. The only person who doesn’t seem tainted by the past is Jake’s brother Frankie. Michael Fox’s character seems to be less affected than any of the other characters. He has a level head on his shoulders; rather than reacting to news, he seeks to find out the truth. Is Beth really dead? Sadly for him, his idea of finding out whether Beth is alive or dead leads to him getting shot and ending up with even more complex issues to deal with. The only character to have shown any stability is now locked in a house with a confused Beth looking after him! It is a fascinating play exploring the workings of the mind and the lies we tell ourselves, the worlds we create for ourselves and each other, how delusional we can become; how ambivalent we are of family relationships; how isolated people can feel despite being surrounded by people. The cast and creatives have done an exceptional job in creating this disturbed world. And whilst this play is set in the vast wilderness of Montana, America, it could be set anywhere; you don’t have to be in the wilderness to feel lonely and misunderstood. I feel very blessed that I watched this play, despite my initial preconceived ideas! Even better, I get a second opportunity to watch it next week, thanks to winning tickets from Defibrillator Theatre Company! A Lie of the Mind plays at Southwark Playhouse until 27th May 2017. I ended March reading Sharon Bolton's third book in her Lacey Flint series, "Like This For Ever" and I was going to start April with the fourth installment, however, I got side tracked by a book that a friend bought for me. She was interested to see what my take on it was. How Powerful Can the Mind Be? 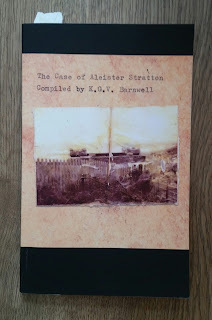 The book my friend bought for me was The Case of Aleister Stratton - Compiled by K.G.V Barnwell. I was instantly intrigued the moment I saw the cover with its old fashioned typewritten font. 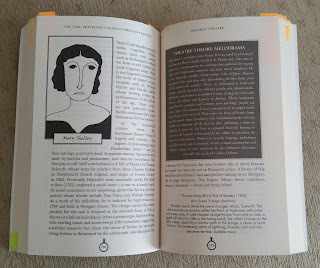 Before opening the pages I was reminded of the occultist Aleister Crowley, due to the unusual spelling of the name, so I was anticipating a dark, twisted tale, and that, I am pleased to say is what I got. The premis of the story is what it would be like to wake up one morning, believing that you have committed a murder. Is it a dream, or is it reality? The mind is a powerful organ, but just how powerful can it be? 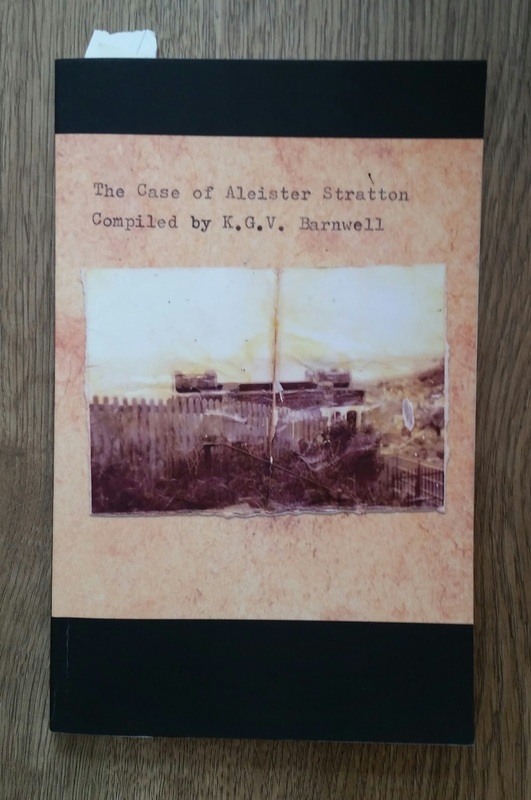 The Case of Aleister Stratton is something of a revelation. I've not read anything like it before. Kate Barnwell is known for her poetry, and that is clearly evident in her prose. This is a novella full of poetic imagery; you get swept away with words which create a painting in the mind. Maybe I enjoyed the tale because it appealed to my antiquated sensibilities, the words painted a bygone Edwardian era. 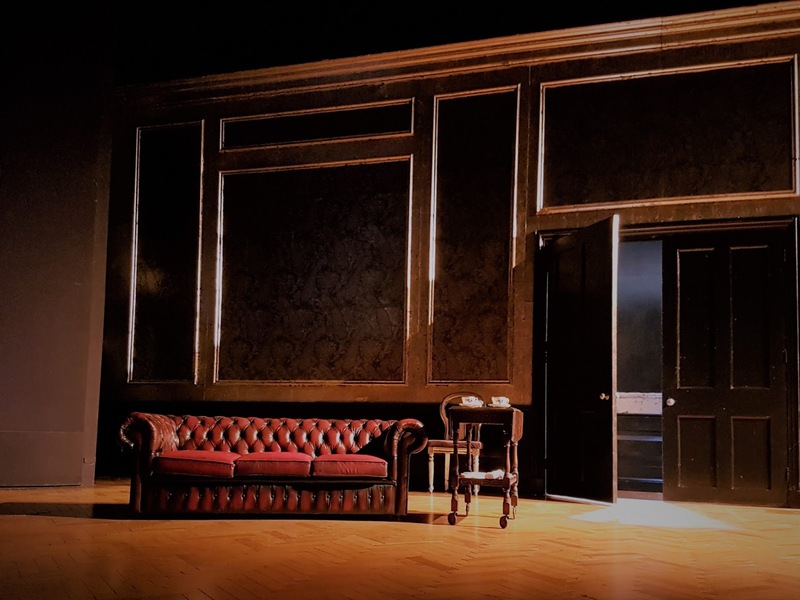 The details and imagery of the mother's bedroom were exquisite, you were transported into the room, as though you, the reader, were actually walking around in it. You could imagine being able to pick things up from the bedside table. I half expected Sherlock Holmes to appear to tell me the game was afoot! "Something has been done, but not as I thought"
Aleister believes he has killed his mother and his sister, he confides his dreadful crime to a professor of English Literature, turning the poor man's life upside down. It is compelling reading. Are we voyeurs of a horrific crime, or are we just seeing into someone's vivid imagination? 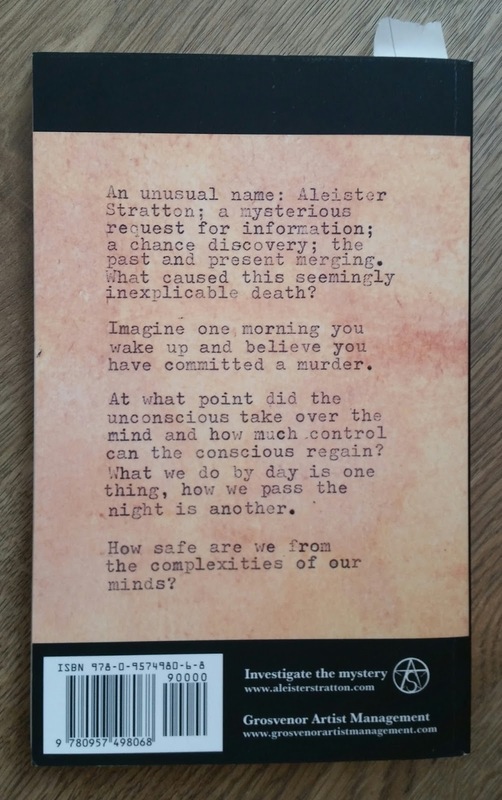 This drifting between Aleister's conscious and unconscious mind makes intriguing and compulsive reading. This is no ordinary crime novel. It mixes the Kafkaesque disturbed mind with the eloquent language of Edgar Allen Poe. It looks at the darker side of life, the bleakness of human nature, questioning why we do the things we do, whilst interweaving the beauty and complexities of the English language. This is a book which warrants the readers attention, so curl up in your favourite chair and be transported to a bygone age. Once you have picked the book up, you won't be able to put it back down. I managed to got side tracked again as I had promised to see a friend in Arsenic and Old Lace. I decided I'd better read the script before going to watch it. Funnily enough, even between those pages I still couldn't escape a murder or two! Finally I got myself back on track and read the fourth Lacey Flint novel. I heartily recommend Sharon Bolton's crime novels, they leave you gripped at the turn of each page. Each chapter flits between Lacey, the various crimes that are committed, and the various personalities that she comes across. The books take us to various haunts around London, and it's interesting when a street or area is mentioned and you recognise it. When you next walk down the street, you start seeing things from a new point of view. I love Lacey's feisty yet damaged character, and I hope that there will be more tales for her to tell in the future, especially as in the last novel her past is beginning to unravel. For the time being though, I'll have to concentrate on clearing the bookcase of the pile of other unread novels that I have calling to me. 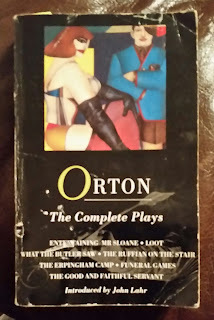 I'd started trying to read The Complete Plays by Joe Orton a few weeks after listening to the BBC Radio 3 drama The Visa Affair starring Tom Burke and Russell Tovey, but I made the mistake of reading the book in order! 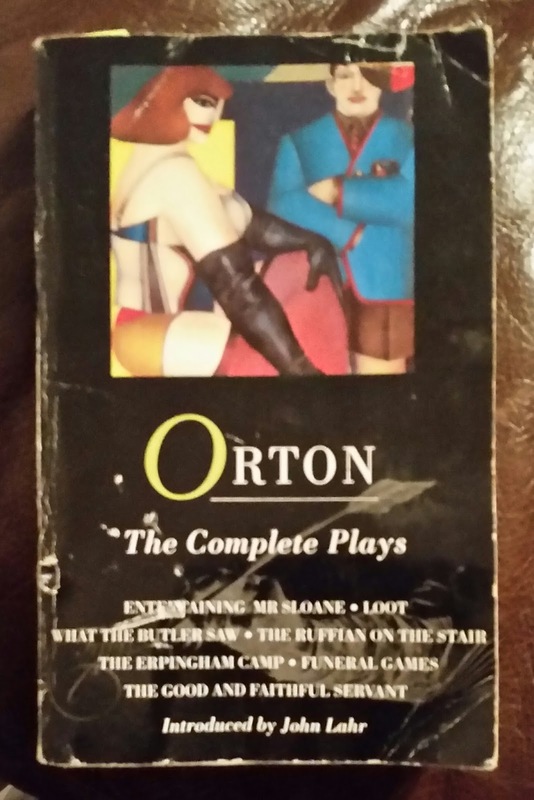 The introduction about Joe Orton's life was interesting, but his first play The Ruffian on the Stair seemed to go nowhere. It ended rather abruptly. I found I was wanting more, in need of some sort of explanation. I felt a bit cheated and bored and so the book got cast aside. I suddenly took a notion to pick it up again, however, this time I flicked through and landed on a play called Loot. This was far superior. I was laughing out loud at the absurdity of it all and really, it was no laughing matter. It is a play of many depths, a bit like its writer, and it allowed me to venture further into the trademark world of Orton and the complexities of relationships. Having given the book a second chance I decided that he was another playwright to add to my list of "must see" plays. I don't know if serendipity struck me again, but a few days later it was announced that Loot is being performed in the summer. I immediately bought a ticket, that is one play I'm not going to miss! Finally it was time for a history lesson. Whilst down in London watching plays, I always end up in The National Theatre bookshop...let's face it, the last thing I really need is anymore books, I have a huge pile to read, but this one sang out to me - The Time Traveller's Guide to British Theatre. Now I am hopeless at history. I can't remember dates or people's names and my history teachers were as dull as ditchwater, but I do find the past a fascinating place. This is not the book for your serious historian, this is a lighthearted review of the last 400 years of British theatre. 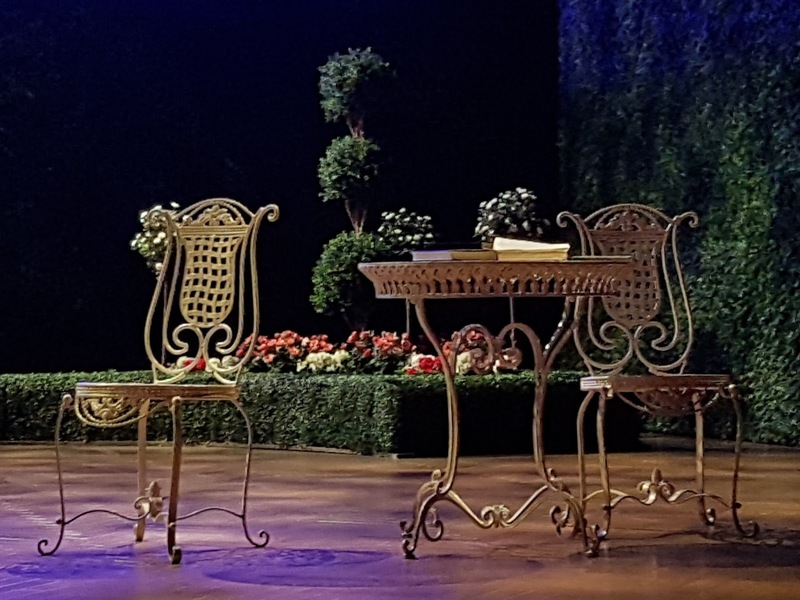 Each era has a guide showing us around, it is written in the style of a tourism guide, and it gives some interesting incites into the world of Shakespeare, the rivalry of theatre companies, the evolving audiences and the styles of play written for them. As you are guided around Britain, there are resumes of some of our more prolific playwrights and snippets of reviews from newspapers. I really hope that an audible version of this book is recorded in the future, as it is the perfect thing to listen to in the car, or whilst relaxing in bed when your eyes are too tired to focus on the pages!